The teenage (and innocent) John Wayne Cleaver swears he is not the serial killer that has emerged in his small town–despite his grisly name and a series of unpleasant and eerie similarities. His fascination with the killer leads him to launch his own investigation of sorts–one that leads him to the identity of the murderer. 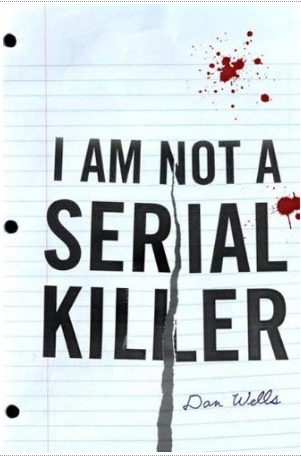 I Am Not A Serial Killer is the first of three novels revolving around John Wayne Cleaver. ** SPOILER ALERT** Be advised I have some minor spoilers below. John Wayne Cleaver has known something is different about him his entire life. The interactions of others rarely make sense and he doesn’t connect emotionally with anyone, not even his own family. He had many things in common with serial killers. They shared the same behaviors, urges, and hungers. Not good in a fifteen year old boy in high school. The only difference between them and him was that he refused to let the monster out to play. Most wouldn’t call his life normal. By trial and error, he formed a set of rules to lock the monster behind a wall. Working in his family’s mortuary provided him with a safe way to channel his fascination with the dead. Another outcast boy at school became his shield there. He wasn’t the eccentric loner, rather just one of the odd kids. One that kept writing homework assignments about serial killers, sure, but not dangerous. Then a local man was disemboweled. The monster inside John stirred at the news and he had to go see the place where it had happened, even if it wasn’t safe for him or those around him. He told his therapist, who promptly told his mother. She didn’t know what a sociopath was, but she was pretty sure working with dead bodies wasn’t healthy for John, so she banished him from the mortuary. That hurt, and made the monster harder to control, but he found a new hobby–tracking down and identifying the serial killer. As the death toll mounted, he pieced together a profile. When a chance encounter revealed everything, he called the police. That didn’t turn out so well for the police, because the killer was literally a demon. More determined than ever, John wasn’t going to let that minor detail stop him from bringing the killer down. He set his rules aside and started plotting to kill the otherworldly being. Unfortunately, that also freed the monster within him. Could a fifteen year old boy fight a supernatural force and his own psyche? And would the people he should have cared about pay for his lapse, either at the claws of the demon or at his own hands? This book wasn’t at all what I expected when I started reading it. I had heard it was horror, but I didn’t feel horrified. The sense of dread I expected of a horror novel never appeared. While it had serious similarities to watching an episode of Dexter, it is not a rip-off, just similar. I’d almost call this an urban fantasy with an unusual protagonist. The ending satisfied me and I will read the other books in this series as time permits. I’ll give it four out of five stars.